A prototype Titan blimp undergoes autonomous flight tests in the Mojave desert. 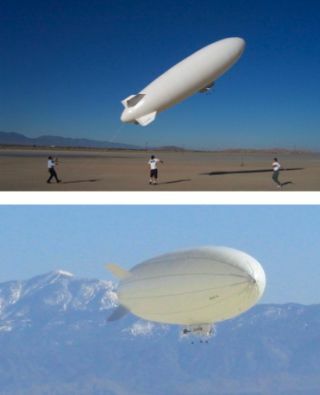 Upper image shows liftoff and lower image shows the blimp in autonomous flight mode. Blimps and balloons are routinely used on Earth for aerial surveillance or to conduct research in hard-to-reach places. Similar unmanned flying vehicles, or aerobots, could open up new vistas in planetary exploration, providing an inexpensive way to observe large swaths of alien terrain without ever touching the ground. Rovers that can cover a few kilometers have boosted our knowledge of the moon and Mars, taking up-close images of the surface and analyzing rocks and soil. A downside to rovers is not only their slow travel speeds and limited mileage, but their tendency to get stuck in sand traps or other treacherous terrain. Aerobots would be able to smoothly glide over regions that rovers view with trepidation, covering thousands of kilometers by floating in the atmosphere of planets and moons and providing a closer look at volcanoes and lakes than is possible with orbiting spacecraft. A balloon is a platform to carry scientific instruments to places you couldn't get to otherwise, a way of covering a relatively large distance in a very short amount of time, said Jeffery Hall, who is leading the planetary balloon effort at NASA's Jet Propulsion Laboratory in Pasadena, CA. Aerobots could be as simple or sophisticated as a mission demands, Hall said. On the one end they could simply sail with the winds at a constant altitude, taking pictures and sampling the atmosphere's chemistry. At the other end you could imagine a blimp-like vehicle with a power plant, propellers and propulsion system with smarts so that it could fly itself in a highly autonomous fashion, he said. The Soviet Union's 1985 Vega mission to Venus has been the only successful planetary balloon exploration to date. That mission sent two balloons, each 3.5 meters in diameter with a 7-kilogram instrument pod hanging below. Each balloon operated on battery power for nearly two days (46 hours), floating 54 kilometers above the planet's surface. Hall and his colleagues are developing and testing much more sophisticated balloon technology that could be used to explore Venus, Mars and Saturn's moon Titan. Each of these destinations has its own unique challenge. Titan's cryogenic environment, with a surface temperature of negative 180 degrees Celsius (minus 292 F), would need a balloon made of a material that does not become brittle when exposed to extreme cold. The surface temperature on Venus is hot enough to melt lead and while the planet's upper atmosphere boasts benign, Earth-like temperatures, it is shrouded with sulfuric acid-laden clouds. Meanwhile, the low atmospheric density on Mars makes flying balloons a challenge, requiring very large, lightweight balloons that can carry small payloads. Hall's team is developing different balloons that can stand up to these tough conditions. They have designed, built and tested two Teflon- and Mylar-coated prototype balloons that could survive the acid corrosion on Venus. They are also working hard on two aerobot concepts for Titan a blimp and a hot-air or Montgolfier balloon even though a NASA mission to Titan is at least ten years away. The Cassini mission, which sent the Huygens probe parachuting into Titan's atmosphere, revealed a landscape with dried river channels and tantalizing evidence for rain, oceans and lakes. Titan has a dense cloud cover that prevents orbiting spacecraft from taking high-resolution visible wavelength images, so future missions to Titan would ideally dive down through the concealing atmosphere to study the moon's surface, just as the Huygens probe did. To stay mobile on Titan it makes sense to stay suspended above the surface rather than land, since the pictures from Huygens show a rough terrain that would be difficult to traverse with a rover. A prototype Titan blimp has been successfully tested at cryogenic temperatures. Now the challenge is perfecting autopilot features, a requirement since radio signals can take over 70 minutes to travel one-way between Earth and Titan, and sometimes Saturn blocks the signals completely. The researchers are testing a navigation and control system that can guide the balloon based on images of the terrain. A rover can sit still and be safe, Hall said. Aerobots are always moving, so it's a different kind of operation. You can't say Stop, give me a couple days to figure out the answer to your problem. The recent crash of a NASA balloon in Australia proves that missions that use inflatable devices can be difficult and are subject to uncontrollable events. The most cumbersome problems to overcome for any successful aerobot mission are deployment and inflation. The balloon or blimp first would have to be folded and stored inside a spacecraft for the trip to the planetary destination. Then, upon arrival, you have to unfold it, fill it up with gas that you either take with you or take from the atmosphere itself, Hall said. The Soviet Vega balloons were inflated while descending into the atmosphere hanging from parachutes. Most of the balloon concepts have followed in those footsteps, said Hall. It's safer to fill up as you land than land first. However, aerial deployment comes with its own risks: tethers or parachute strings can get entangled, and more fragile balloons can tear during unfolding or inflation. The thin balloon materials needed for Mars thin atmosphere pose a particular challenge in this respect. For now, Hall and his colleagues have set their eyes on Venus and are putting together a proposal for a Venus balloon mission that they plan to submit for NASA's Discovery program. Their proposal for the 2006 Discovery program did not make the cut, but Hall is confident in the new reworked and heavily tested balloon design. The prototype 7-meter diameter balloon is designed to carry a 100-kilogram payload and float at an altitude of 55.5 kilometers in Venusian acid-laden clouds. Tests show that it should be able to float for 30 days or more, circumnavigating Venus every four to six days. I would argue that the technology for Venus is ready, Hall said.